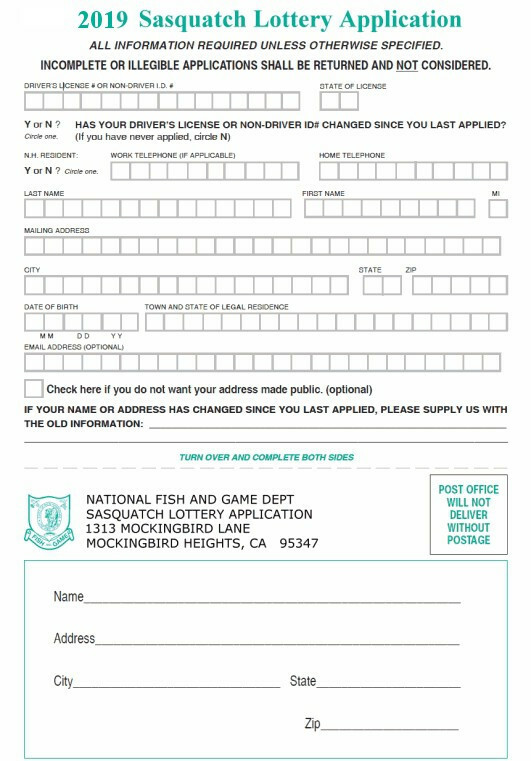 Print and complete the application displayed below to enter the 2019 Sasquatch Hunt lottery. Applications must be received before April 5, 2019 in order to participate in the final drawing of the year. Enclose a personal check or money order for $50USD with your entry form. This lottery fee is non-refundable and is used to support the lottery system as well as develop ongoing sasquatch habitat and management systems. All persons submitting legitimate entries by the deadline will receive a 2019 sasquatch hunt stamp. If you win a lottery license, this stamp is required to be on your person while hunting, but is not in itself a license to hunt sasquatch.